Always wearing my camera allowed me to capture cousin Kim talking to Lucky. When you’re out making pictures, put your phone in airplane mode and leave it in your pocket. 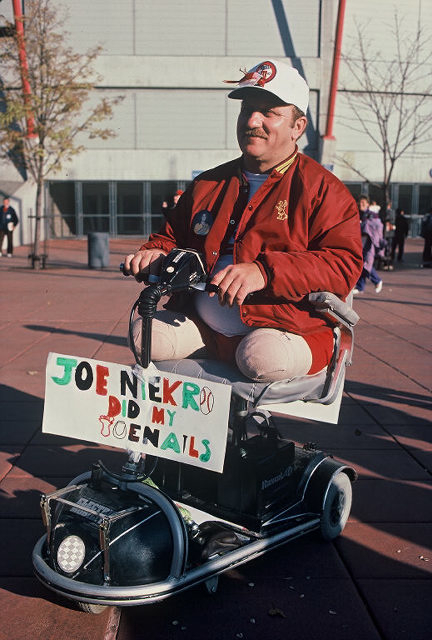 If I’d been looking down at a phone, I would have missed this gentleman’s gift of humor to us at the 1987 World Series. What’s his sign about? Click here. What’s the best camera? The one you have with you. How you see - and how you use whatever you already have - are more important than what camera you use. The Eye of Eisenstaedt: How a Great Photographer Sees - Alfred Eisenstaedt. A must for every photographer. Jon Lewis: Photographs of the California Grape Strike, by Richard Steven Street. Dan Roam’s The Back of the Napkin examines the way we see. Steven Pressfield’s The War of Art and Austin Kleon’s Show Your Work offer guidance for persisting in a world filled with distractions. Use travel time to listen to podcasts like Hit the Streets, The Candid Frame, and LensWork. Print your work. Because looking at physical prints is essential to growing as a photographer, print your pictures on paper, even if you use a digital camera. When you’re done, set your prints aside. Come back to them in a day or so, and think about your work again. Want to sell your pictures to galleries and news media? Show your work at a portfolio review. Be sure to prepare before you go. How do you prepare? Click here to listen to some tips. Bonne chance, et bonne lumière!